There are about 10 seconds, or at least that is what it feels like, between the launching of the missile and the devastating crash of the explosion. They are the darkest moments of my life. As the sound of the falling missile grows, my stomach lurches, I close my eyes and think of my family. The tape of my life flashes before my eyes as we wait to find out if this is the end. Then the explosion - sometimes a distant crack, others a devastating boom. I breathe a sigh of relief; all the while knowing it is some other family’s turn to have their lives destroyed. Yet the reprieve is only ever temporary; these moments have been repeated dozens of times every night for the past month as Israel has pounded Gaza, the small Palestinian enclave I call home. During the attacks, you abandon the idea of sleeping regularly; the continuous air strikes and shelling make it impossible. Lying in your own bed next to a window increases the risk of damage if the windows shatter so I have a temporary mattress under the staircase where I lie down - reducing the chances, ever so slightly, that the next bomb will be my last. Occasionally, the exhaustion is such that I slip into a sleep so deep that I don’t notice explosions even metres from my home. It was one such night last week that I awoke to learn that the mosque I pray in and the university I studied at had been hit - both partially destroyed by attacks in the night. I had spent over five years at the prestigious Islamic University of Gaza, both as a student and later as a teaching assistant. When I learned the news I was overcome with grief - it felt as if my life was being eliminated, my most cherished memories systematically destroyed. 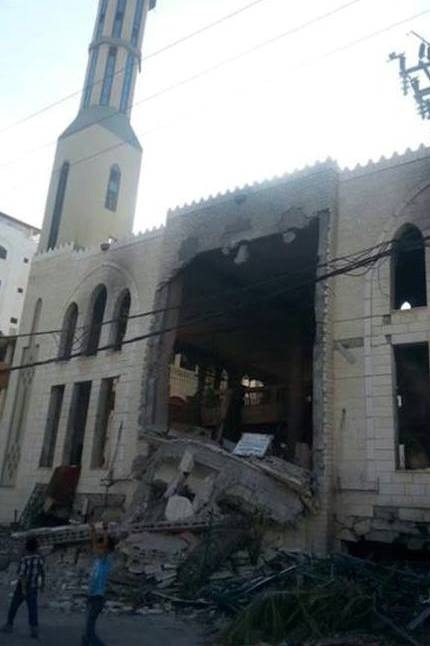 A mosque in western Gaza City destroyed by Israeli bombardment during Operation Protective Edge in the summer of 2014. In a place as small as Gaza - less than half the size of New York City - nowhere is safe. My neighbourhood, in the west of Gaza City near the beach, was not in the centre of the ground offensive but it was not much luckier than the rest. A residential building a few metres from my home was destroyed, while the area has been badly damaged. Since Gaza’s only power station was destroyed, we have been plunged into darkness. The lucky ones were getting electricity for one or two hours a day, but in recent days even that has disappeared. My family has a diesel generator that we occasionally turn on to check the news but it is expensive and fuel is sparse. The rest of the time we sit, often listening to the local radio news. Every report brings with it new tragedies, civilians killed by attackers they never even saw. The more I listen, the angrier I feel that the world is just watching as we are dying. In the end, I turn off the radio. In the house we have been running low on even basic supplies. The 72-hour ceasefire has helped ease the situation somewhat, but even now every day is a battle to get what we need to survive - drinking water and food. In my house, the water stopped flowing days ago and the sewage is overflowing. To get undrinkable water for washing and cleaning, we have to call a private company to come fill our tank. In recent days, even this has dried up - the destruction to the water infrastructure is such that even private companies have nothing to sell. Instead we are using the “grey water’ concept of reusing wastewater to flush the toilets. The few times I have risked going outside during the attacks, the scenes I have seen have become etched into my memory. Children rushing around, risking their lives carrying empty bottles to get water, others standing in long queues to get bread; it is too painful to think about. We are reaching the end of the ceasefire, but it is not yet clear what happens next. We have stocked up our resources, preparing for the next round. I have enough drinking water for 10 days and stocked up on tinned cans, while we have bought some meat and vegetables but they won’t last long - more than a day or so - without electricity. If the bread goes stale we can wet it and put it in the oven to make it edible again. Many Palestinians are tired and sad. In the rest of the world I am 26 years old, but here in Gaza we have a different measure of time - I am 3 wars old. Too many years of Israeli attacks have worn us down. When I graduated I had options to work in many countries. Instead I returned to Gaza to rebuild the city I know and love. Now we are faced with starting again. Yet we also share a common spirit of resilience. We have paid a high cost in lives in this conflict. But if that’s the price for long-term changes – breaking the siege and obtaining freedom – it’s one many of us feel we have no choice but to swallow. Otherwise, we would merely be replacing the quick death of an airstrike with the slow death of the blockade.